To enter for the 2019 race please send an email to Dronfield Relay via the contact form (http://www.steelcitystriders.co.uk/contact-us/) selecting Dronfield Relay drop-down and telling us in the message your current expected times for (one or more of) a flat 5km, 10km or half marathon. No fibbing!! We will then create Striders teams of mixed time ability to create an evenly balanced, fun-packed race. As in previous years, non-Striders teams of six runners are warmly welcomed to join us for this great day of relaxed racing and social. Non-Striders teams are asked to make a nominal £10 entry fee per team towards catering costs at the post-race buffet at Victoria Inn. The call for runners will close Sunday 19th May. The Dronfield relay is an annual team event for Striders and invited guests and always a great day in the Striders calendar. Each team is made up of 6 runners with a pair running together on each of the 3 legs of the course. The race covers a total of around 15 miles through the countryside around Dronfield and Coal Aston with each leg being approximately 5 miles long. It is a low key event with a focus on enjoying the run and socialising afterwards rather than cut and thrust competition. All Striders teams are pre-mixed by ability and all non-Striders teams are time-handicapped so everyone has a decent chance of victory. The relay starts at Holmesfield at 10:30 opposite the George and Dragon pub. It finishes back where it started outside the George and Dragon pub at about 12:30. There is a buffet in the Victoria Inn pub, Dronfield, afterwards, paid for by the club. Recent years have seen our biggest ever fields of teams and great days of Striders racing and social. We’re looking forward to an equally enjoyable event this year! 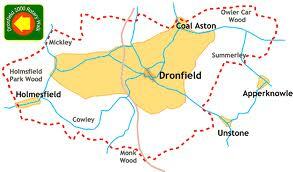 Any enquiries please email the Dronfield Relays team via the contact form on the website.